International numbers must be saved in Contacts starting with "00" or the "+" sign. UK numbers can be saved as normal. Press the BlackBerry Menu button after selecting the contact number stored, and select "Call using Auracall"
Caller will see "Pausing for 3 seconds" shortly afterwords on the screen. Please hold on the line and wait to be connected. To redial, press the * sign and enter the destination number starting with 00 followed by the # sign when prompted. Do not press the 'Call' button again at this stage. The Auracall Smartphone Apps allows you to use the T-Talk service without the need to dial an access number as the application will do it for you automatically. Normally it is cheaper to use the Auracall T-Talk service to call international numbers (Numbers starting with "+" or "00"). Once it is switched ON, the application will automatically route your calls by using Auracall's access number. This will whenever you dial an international number (a number starting with "00" or "+" and NOT a UK number). Once the 0800 / 0845 / 0870 / 0500 option is switched ON the phone will dial these numbers via Auracall's T-Talk service. 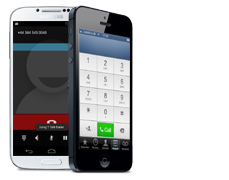 The Auracall android app allows you to easily use the T-Talk service when dialling any number from your favourites list, recent calls, contacts or using the keypad directly. The Auracall iPhone App allows you to easily use the T-Talk service when dialling any number from your favourites list, recent calls, contacts or using the keypad directly. There is no need to dial any access numbers as the application will do it for you automatically. If you have internet access on your mobile, please register your phone number here to receive an SMS with a link to download the application. If you don't have internet access on your mobile, click here to download the Auracall Smartphone App to your computer.Then transfer the application onto your mobile via Infrared, Bluetooth or a USB Cable using The BlackBerry Desktop Manager. Once it is switched ON, the application will automatically route your international calls (a number starting with "00" or "+" and NOT a UK number) by using Auracall's access number. BlackBerry OS 4.2 and higher (Auracall Smartphone App is not supported on devices older than OS 4.1). Text to 80077 or 67400 will cost you £5.00 plus your standard mobile network rates and will be charged by your mobile service provider. Text to 65656 will cost you £10.00 plus your standard mobile network rates and will be charged by your mobile service provider.